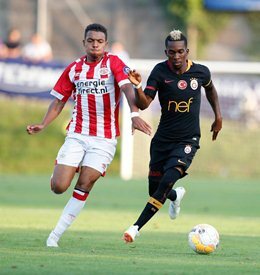 Super Eagles striker Henry Onyekuru is leaving no stone unturned in ensuring he is back in favour for Gernot Rohr's team by the time the 2019 AFCON qualification rolls around, following his latest performance for Galatasaray in their 1-0 victory. The 21-year-old made his second league appearance for his Turkish Super League team yesterday against Goztepe Izmir and he repaid Fatih Terim's faith in him with the match winner. The Nigerian made the most of a pass teammate, Fernando to lift a pin-point chip over goalkeeper Bakırbaş in the opposition goal three minutes to halftime at the Turk Teleykom Stadium. Prior to his first competitive goal for the club, the Everton loanee scored two in four pre-season games against Valencia and Club Africain. Elsewhere, Bright Edomwonyi scored a brace for Austria Wien in a 4-0 trouncing of Admira in an Austrian Bundesliga clash. The 24-year-old opened scoring at the Generali Arena in Wien after 23 minutes before adding another seven minutes later. The striker now has two goals from his first four league games for the 2018/2019 season.